Created by Brian Clemens, the man behind The Avengers, The Professionals ran on London Weekend Television for 5 seasons and 57 episodes between 1977 and 1983. There was a two year gap between the last episode of season four It’s Only a Beautiful Picture which aired on 27 December 1980 and the first episode of season five Foxhole on the Roof which aired on 7 December 1982, although the last series of programmes were actually made in 1980 and 1981. This box set contains all 57 episodes, each episode running around 50 minutes. The Professionals is high quality TV and very entertaining viewing over its five seasons. The first season was strong, but uneven, with a number of episodes written by creator Brian Clemens; thereafter he wrote a few episodes in different seasons that tended to focus more on the characters and raise questions about the morality of what the CI5 operatives do, such as Mixed Doubles or Involvement. By the second season The Professionals was hitting its stride with its new title sequence, more hi-tech offices for CI5 and strong episodes about corruption in high places such as Not a Very Civil Servant. Generally the formula of thrills, action and banter works very well in episodes like Private Madness, Public Danger or Everest was Also Conquered which involves a mystery and a cover up going back 20 years. However, there are weaker episodes when the winning formula is changed, such as Close Quarters, that concentrates on Bodie, Klansmen and Runner where Doyle is the main man, Stake Out, with its very different tone, A Weekend in the Country in season four where Bodie and Doyle spend pretty much the entire episode as captives, which is not very interesting or believable as our heroes should have been be able to take down these not very bright villains with their eyes shut, or in season five where both A Man Called Quinn and Lawson’s Last Stand have little to do with Doyle and Bodie at all. Wild Justice in season four is also very strange. However, other episodes that change the formula, such as The Rack, The Purging of CI5 in which the very existence of CI5 is threatened, Stopover in which Cowley is betrayed and his life in danger, or the double and triple cross of Need to Know are cracking episodes. Each episode of The Professionals stands alone and there are no continuing story lines and no character development which means, for example, that in Close Quarters Bodie’s arm is in a sling without explanation or that at the end of The Female Factor Doyle is on crutches after being shot but in the next episode aired he is fully fit. In The Purging of CI5 Sally Harrison as a very resourceful CI5 female agent who plays a major role but then is never seen again (although Harrison does appear in another couple of episodes in minor roles as different characters). The cover of this box set notes that “this release adhears (sic) to the original production order of the episodes” which is not the order the episodes were shown; thus, for example, the first episode which aired on 30 December, 1977, Private Madness, Public Danger, is the sixth episode in the box set. Part of the fun in these older TV series is seeing familiar faces crop up. In The Professionals recognisable faces include blonde Pamela Stephenson, who has bit parts of increasing length in three episodes, bureaucrat par excellence Geoffrey Palmer, who appears once as a government minister, once as an industrialist, an almost unrecognisable David Suchet, Poirot himself, as a heavy, the very recognisable craggy features of heavy Walter Gotell, Lalla Ward (Romana to Tom Baker’s Doctor Who), Hammer stalwart Andre Morell, probably best remembered for his excellent Watson in The Hound of the Baskervilles (1959), Glynn Edwards (bartender Dave in Minder), Emperor Palpatine himself Ian McDiarmid, Australian veteran Ed Devereaux as an Irishman with a very Australian accent, Patricia Hodge, probably best known as Phyllida in Rumpole of the Bailey or as the lead in Jemma Shore Investigates, and a very young looking Charles Dance as a South African thug. There are also some notable directors involved: veteran Charles Crichton (The Lavender Hill Mob (1951),A Fish Called Wanda (1988)) directed Look after Anne while Martin Campbell (GoldenEye (1995),The Mask of Zorro (1998), Casino Royale (2006)) directed five episodes. Another director with multiple episodes is William Brayne, almost exclusively a TV director, who directed eleven episodes. Being a TV series from the late 1970s early 1980s, and a British TV show at that, violence, car chases and gunfights occur regularly but body counts are normally low (although there are exceptions in episodes such as Where the Jungle Ends); instead it is brains and guile, contacts and deduction but with back up brawn not limited by the usual niceties of police procedure, that solves the problems. Other things that date the show are the fashions, including men’s bell-bottom pants, thick ties and moustaches, dolly bird female outfits, the absence of mobile telephones, state of the art (then) massive banks of tape driven computers and some very non-PC attitudes towards woman and minorities including blacks, Arabs Asians and gays; season one contains the most controversial episode Klansmen that was never shown on television due to its racist content. Probably most of the episode is not that extreme although some of the racist sentiments expressed by Bodie (before being converted so to speak) are still cringe-worthy coming from one of the heroes of the series. But what has not dated is the delightful interplay between the leads and the good storylines making The Professionals still cracking entertainment four decades after being made. 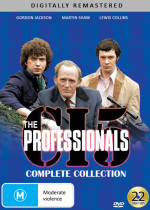 The Professionals: Complete Collection is a 22 disc box set contained in 4 individual cases; three cases have 6 DVDs, the other 4. Eighteen of the DVDs contain mostly 3 episodes of the series while one DVD in each case is reserved for extras, and has one episode. The Professionals is presented in the original 1.33:1 aspect ratio, 4x3 in the PAL format. The DVD cover notes that “every possible effort has been made to produce the highest quality DVD release. Due to the quality of some of the original elements, some visual and audio imperfections may be experienced”. However, all episodes have been digitally remastered and look very good indeed. A couple of extras in this set include restoration examples. Detail is firm in close-ups although wide shot exteriors are softer. However, the print is good enough to see clearly that the people in the crashing car in Slush Fund are dummies. The episode Klansmen uses stock footage of London riots and so is considerably softer. Generally the colours are deep and vibrant such as Doyle’s brilliant yellow T-shirt in some episodes while the London sky looks impossibly blue; also check out the vivid red tracksuits in Long Shot or the bright red and lime climbing ropes in Foxhole on the Roof. The vivid reds sometimes bleed however, such as the bright red blankets used to cover bodies, as does a vivid blue on occasion. Blacks and shadow detail are very good, skin tones natural and brightness and contrast consistent. There is blur with movement in some episodes and grain in wide shots of London, airports or the coast. Otherwise, I did not notice any marks or other artefacts. Audio is a choice of remastered English Dolby Digital 5.1 at 448 Kbps, the original English Digital 2.0 mono at 192 Kbps and a music only track, English Digital 2.0 at 224 Kbps. I sampled both the 5.1 and 2.0 audio tracks. In each the dialogue was clear and easy to understand, which, given the number of quips, was a bonus. The 5.1 obviously has more separation and some decent effects including explosions, gunshots and squealing tyres, as well as other effects such as distorted voices in A Man Called Quinn, in the rears and surrounds. Sub-woofer use was minor, mainly explosions and the music. The effects and especially the music in the 2.0 were more strident and shrill but still made for a good listening experience. The music by Laurie Johnson was excellent, and very infectious. Lip synchronisation was fine. Pops and hisses were absent. These extras can be selected individually or there is a “Play All” option. Made for Granada Television in 1996 this is a delightful and frank look at The Professionals featuring footage from the series and interviews with stars Martin Shaw and Lewis Collins, creator / writer / producer Brian Clemens, director Martin Campbell, ex-criminal and writer (that is what the caption says) John McVicar and TV critic and writer Hilary Kingsley. Matters covered include the less than harmonious, indeed fractious, relationship between Martin Shaw and Lewis Collins, changing the main cast after 3 days of shooting the first episode, the invention of CI5, conflicts about scripting and ad-libs, the non-PC and sexist tone of the series, Gordon Jackson playing against type, the episode Klansman LWT refused to show. This is great stuff. The end titles of the first episode with a CI5 background. The vision that played behind the titles in season one that was later replaced. No text. Raw black screen footage of a stunt plus the finished scene. The season two titles were remastered in 2012; the before and after comparison. Split screen with before and after restoration comparisons. There are 16 individual stills galleries with mostly black and white, but some colour, stills. There are portrait galleries, the titles sequence, merchandising and on set and production stills from the episodes in this first case of DVDs, hundreds and hundreds of photos, some galleries with over 200; they advance automatically without sound. Film from the B camera in a two camera set-up. Quite funny as something goes wrong. An extended promotion for the show in the US. There are 15 individual stills galleries with black and white and colour stills. There are portrait galleries, on set and production stills from the 13 episodes of season 2 and pictures of memorabilia, including novels, magazines, toys and colouring in magazines based on the show. The numbers in each range from around 50 to hundreds of photos; they advance automatically without sound. There are 15 individual stills galleries with black and white and colour stills. There are pictures of Lewis Collins’ military training, on set and production stills from 13 episodes and pictures of memorabilia, including magazines and colouring in books based on the show. The numbers in each range from around 20 to a couple of hundred photos; they advance automatically without sound. The DVD cover indicates that this disc contains “PDF Material” which is not present. A decent extra showing the process of restoration, including where the original negative was too damaged to be used. There is no narration; the extra consists of some screen text indicating the process and plenty of examples of before and after, including split screens. A news item from ITV showing Lewis Collins on a charity run. A news item from ITV interviewing Martin Shaw as he was about to take the lead in stage musical They’re Playing Our Song in London. Essentially Lewis Collins clowning about, with goofs and outtakes, with a couple of goofs with Gordon Jackson. No Martin Shaw. There are 19 individual stills galleries with black and white and colour stills. There are portrait galleries, on set and production stills from the 16 episodes, a Pinair Cross Chanel Charity, some on Lewis Collins and pictures of memorabilia. The numbers in each range from not many to hundreds of photos; they advance automatically without sound. The DVD cover indicates that this disc contains “PDF Material” Then and Now – The Location Files; if it was there I could not see it! There are Blu-rays of separate seasons of The Professionals in the UK plus a Region 2 UK DVD The Professionals: Complete Series. In our Region 4 PAL release The Professionals: Complete Collection we get everything that seems to be available elsewhere. The Professionals is one of the very best British action thrillers from the late 1970s, early 1980s, in my mind right up there with Callan (from the decade previously). Four decades on The Professionals holds up famously – intelligent, action packed, funny and with three actors at the top of their games. Binge watching time! Separate sets of The Professionals’ episodes, termed Dossiers, were released here over a decade ago – the first two sets, containing 14 episodes each, were reviewed on this site. These were not remastered episodes and the reviewer noted softness, hairs, specks, flecks and edge enhancement. This new The Professionals: Complete Collection contains all 57 episodes of the series, all digitally remastered and looking great, plus extras. Missing are the audio commentaries that were available in some of the earlier release sets, which is a pity, but for fans of the series, and fans of classic British TV action thrillers, this is a no brainer. Display LG 55inch HD LCD. This display device has not been calibrated. This display device is 16x9 capable. This display device has a maximum native resolution of 1080p. Audio Decoder NAD T737. This audio decoder/receiver has not been calibrated.